This message was preached by Colin D Cruz at Word of Grace Church Pune, on the 28th of July 2013. This is not a usual preach. How many of us have ready a book of the Bible in one go? How many of done this in a Church context? The Bible in 1 Timothy does encourage us to "devote ourselves to the public reading of scripture". This Sunday this is exactly what we did - we read through 1 Timothy together and it took only 15 minutes!! You can listen to the audio by CLICKING HERE. After that we had a few people share on what struck them from the book and how they will apply it to their lives. Listen and be blessed. Family Matters 2 - How should we treat one another? 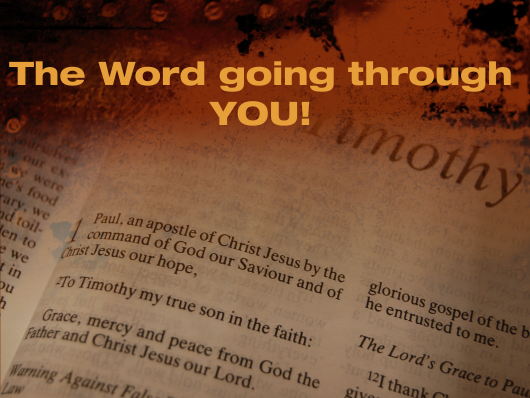 This message was preached by Colin D Cruz at Word of Grace Church Pune, on the 14th of July 2013. The last two Sundays we looked at the positive and negative use of the tongue. Last week we focused on using our mouths to pray. This message starts with some super testimonies of answered prayer. Please listen and be encouraged to pray. The parable is the reply Jesus gives. The parable of the Good Samaritan- On the road from Jerusalem to Jericho which 14 miles downhill and 4000 ft down wards. It was a dangerous road and there were bandits as well. A man gets attacked- he was robbed and stripped and left to die. He survived, but was in desperate need for help. Then a man comes along- A priest. To be a priest in those days was a very special position. Only descendants of Aaron could be a priest and he represents God to man and vice versa. Yet this man who knew the law of God so well passed by on the other side and went away. In verse 32, The Levite did the same thing. They were not Aaron’s descendants who knew the law well but he ignored this man. V. 33- But a Samaritan- Jews who were left behind after Babylon captured them. These Jews inter-married and so these were considered impure and not allowed to live with the Jews. But this outcast or enemy saw the plight of the man and had compassion. He went to him and bandaged his wounds and gave him oil and wine. He must have taken his own clothes and made bandages. He poured it on his wounds- he was generous with what he had. Not only that, he put the man on his donkey and took him to an inn to be taken care of. He also nurses him at the inn- he was with him the whole day and night. The next day, he gave the Inn-keeper 2 silver coins which was sufficient to care for this man and offers even more. This is over-flowing abundant generosity. Q. How do we take care of one another and of people outside? The Good Samaritan is a picture of what Jesus did for us. 1 John 3:16-18 instructs us in this matter. We are celebrating Jesus dying for our sins but John is encouraging us to lay down our lives for our brothers and sisters. E.g. : If you are materially blessed, we need to have pity on those who are not, or else, how can the love of God be in you? When we hear a message like this, we think “I’ve got a need, how can they help me?” Always ask- MFON- My Faults, Other’s Needs because we can easily focus of other’s faults and my needs. God has blessed us so much and more- salvation and so much more! So, look for ways to bless someone- maybe giving a lift to someone. Sometimes it means going an extra mile. Visiting the sick- The least we can do is pray, message them, and make an effort to visit them. Can we be hospitable? When we do this we demonstrate the love of Jesus. Matthew 25:35 says, “I was a stranger and you invited me in.” Often, it means denying yourself. Let us take the example of the Good Samaritan and Jesus and lay down our lives to serve others and be a blessing. Abraham in Genesis 12 was promised to be a blessing to all nations. That is our portion as well. Imagine the whole church doing this- in whatever way you can. Let us be a people who love and serve one another. Amen! Proverbs 18:21- “The tongue has the power of life and death, and those who love it will eat its fruit”. The tongue has great power. The world was created with the spoken word. The tongue is involved in salvation. Last week we saw the negative effect when the tongue is used negatively. But we can use the tongue to build up, to release God’s power into different situations. Today, I want to focus on the use of the tongue for prayer. 1 Thessalonians 5:17- Pray continually. Other versions say- without ceasing/ constantly. It’s a simple and specific command stating that praying is a way of life and a part of the church life. 1. Prayer was a part of Jesus’ life. They saw Jesus do amazing things and they saw Jesus praying- they asked him to teach them how to pray. And that is how we have the Lord’s Prayer which is really a framework. · Praise God first- Honor Him. Then Jesus tells them a story to help them understand better. In v. 5, the friend asks boldly for bread at midnight. This is a parable of contrast. If your friend will oblige you, how much more will God! Jesus then goes on to ‘ask, seek and knock’- it’s a progression. So don’t just ask once but persevere. Then he gives another comparison of the earthly father and Heavenly Father. Jesus is using contrast to the point of it being ridiculous. So how much more will the Father give! These parables are to build faith as what God wants, is for us to be bold and persevering. Do we have unanswered prayers? So how should we pray? Often we pray ‘soft prayers’. That is not what we should do. God wants us to be impudent and shameless in our prayers. Hebrews 5:7- Jesus practiced this-Jesus prayed with loud cries and tears. When is the last time you prayed like this? V.7- ‘and He was heard’. We need to get out of our middle class properness. Jesus at Gethsamene (Matt 26:38) - deep emotions being expressed, great anguish in prayer facedown. We need to change the way we pray and battle with intensity. Q. What about unanswered prayer then? - Sometimes, it takes a long time, but don’t give up even when tempted to. 2 2. Luke 18:1- Parable of contrast. Jesus told them this so that they will always pray and not give up. v. 3- widows in those days were poor and vulnerable. But she kept persisting. And in v. 4-5, finally, the unjust judge gives in to get rid of her. v.7- but how much more God? In v.8, He asks, “will He find faith on the earth?” i.e. it takes faith to believe and keep praying. Maybe you know someone unsaved, sick, in bad financial situations, relationships, jobs, etc. Pray and do not give up. 3. Acts 10:3- Cornelius was not a Jew but was God-fearing. But one day things changed- he had a vision that changed everything. Peter has a vision simultaneously. Till this time the gospel is only shared with the Jews, but through this event Cornelius and his whole family are saved. In v. 44-47- this is the first of the gentiles coming to salvation and this opens the doorway for millions of us. Pray persistently for that ‘one day’ to happen in your life. Mark 1:35- Jesus prayed early in the morning. As we ask, seek and knock- thing will begin to happen. Here is the final part of the script of what was shared at our celebratory evening. ( I have added a little more detail here to make it more understandable). As you read it, my prayer is that you will have faith for your situation, to know that in this journey of faith, you NEVER walk alone. If you are a pastor, or involved in a church plant, I hope this post will be a special blessing to you because this is a story of a BIG FAITHFUL GOD who never lets us down. To connect with all the parts click on label below titled " Journey of Faith". 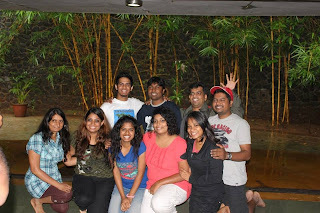 We had just entered our 7th year of being in Pune. Slowly we began to see a more stable group emerge – the outflow had decreased and the group was getting more cohesive. As we had prayed we started to see more local people join the church and that was a good sign. Was the tide beginning to turn at last? Just like Ancient Egypt had 7 years plenty followed by 7 years of famine, our 7 years of famine came to an end. This was confirmed by a prophetic word brought by Guy Miller at the Momentum Conference we had attended . We had already begun to see a stable group of about 40 emerge toward the end of 2009 . Guy also prophesied about Joseph being thrown into a pit and forgotten. That spoke straight into our hearts and situation. We responded to that word ,were prayed for and felt a tremendous release. There were God given dreams and numerous prophecies over both Navaz and I as we served over the years and we longed for their fulfillment. At the conference, David Stroud who leads a Christ Church in London, spoke about a city church and the turnover of people that every city church experiences. It’s higher in more developed cities due to job mobility. Having a 25-30% turnover in people is part of modern church life. We were encouraged no to fight the churn but to embrace it and aim to grow at a faster rate. Over the last 10 years over 200 people have passed through WOG (and we have had more than 500 visitors come to us .) I’m not referring to just visitors but people who been with us for a while and then moved on. Short time or long time, our calling is to love them, equip them and prepare them for what God has called them to and release them. Some of them are back with us while many have moved on. This evening we have Stephen Parmar who is now in Mumbai and Mnason Patton who is now in Bangalore with us. Mnason was a great help to the church and played a key role along with Vinoth (now in the UK) in building the church. Over the last year we have seen almost a 100% growth. From 25-30 the church has crossed 100 people. A church is not a building but is people. A group of people who are passionate about Loving God, loving one another and on a mission to reach out to the world with the gospel. worked hard and have shouldered responsibility in the church for the past few years. Some have taken up responsibility a few months ago – right from set up to hospitality to serving the drinks to leading life groups. They have served, given and been loyal and bought into the vision of Word of Grace. The key word is carried responsibility. As I call your name would you please come forward. Sunny & Deepthi, Anand & Sailaja, Philip & Meher, Joyce, Jaya, Rakhi, Sravanthi, Austin, Jeevan. Today we have new people on the worship team and new worship leaders being raised up, from just one Sunday school teacher we now have 6, from the serving team being just my family and maybe a couple more we have a whole vibrant army of over 30 people who serve wholeheartedly in different ways. We have much to thank God for! We are not only financially self sufficient but we give away money to various church plants, social projects and have even sent money to Kenya and Zimbabwe standing with our brother overseas . We are privileged to be a part of a wider body of Christ . In addition to these there are 3 other people who are part of this core team. They are Navaz my darling wife who has stood with me these past 10 years in Pune. The Lord has provided me a wonderful partner who makes up for all my many weaknesses. She has carried the church with me right from day 1 and even before when we served in Living Word Church for 8 years. 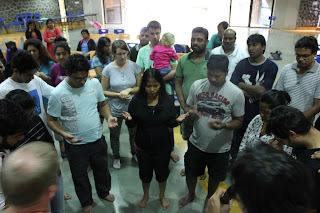 When we moved to Pune with 6 month old Jessica, we would load up the car with the equipment, set up the hall, Navaz would lead worship, then breastfeed Jessica and then be involved in clear up. Thank you Navaz. She has carried Sunday school, the worship team, set up our website, the bulletin, hospitality, pastoral issues, etc. etc. Wow – what a woman. I thank God for her. Also our two children Andrew and Jessica have grown up in a church planting atmosphere. They have made many sacrifices one of which is not having friends of their age in the church. They have been fully involved in being part of a church plant. Andrew used to handle the OHP projector from the age of 7. From the age of 9 he played the bongos and then the drums. Jessica too started handling the OHP at the age of 7 and then at the age of 9 she handled the DLP. She has trained other adults on how to use it. All these today form the core group that serve and have taken on responsibility. I’d like you to put your hands together and honor them. You have served sacrificially and gone the extra mile. This group is not exclusive. It’s functional. It’s made up of those who not only serve but who take on responsibility. In time we’d like to see many more people become part of this core group as more people take on responsibility. Apart from this core group there is a large number of people who sacrificially serve in the church. And I am thankful to you. The set up team comes in at 8.30 on Sundays, there are others who serve cold drinks, serve us ushers, count the offering, serve on Sunday school, etc. If you have served in any capacity would you please stand. Philip & Meher came to know Jesus, were baptized and joined WOG 3 years ago. They have a great heart for hospitality and have opened their hearts and their homes to visitors and church members. There is one person we are very grateful to God for i.e Ryan for giving us this hall for the last 10 years. He has been our man of peace who has been a blessing to the church. Jesus came to seek and serve the lost and to give his life as a ransom for many. At Word of Grace our desire is to imitate our Savior. We want to be people who seek servanthood not titles. Where do we go from here. A friend (who is not a Christian) said this to me recently. Colin, your wasting your time in this country. Go abroad. You will have a better live. This place is so corrupt. I told him. I have a great life here. The reason I am in this country is because it is corrupt. Only the gospel will change the nation. If the gospel had not come to India a couple of hundred years we would still be in the dark ages. “ Only when Jesus is accepted as Savior and Lord will India be transformed. Our mission is the one Jesus outlined 2000 years ago. Love God. Love People. Love the Lost. Preach the gospel. His last command must be our first priority – Go and make disciples of all nations. Our goal at WOG is to make disciples who make disciples. Enjoying God. Making Friends and Changing Lives. As John Wesley said “The world is my parish! “and we want to see the Kingdom of God come here in Pune and also be involved in taking the gospel to regions beyond. There is a lot to do and we are excited about this next phase God is taking us into. What are some of the things we are so thankful to a faithful God for? · Sustaining us over these last 10 years – His grace has given us the strength to perseveres through 7 years of hardship, drought, hostility, betrayal and loneliness. · Providing for us financial through our business ventures. · Despite the hardships we saw souls saved and many get baptized. · The turnaround in 2010 where we started the year with about 40 people but closed the year with 105! · We have gone from one Life Group to 3 with an average of 40-50 people attending it. · Musicians we have raised up and given away. · Many leaders we have raised up and given away. · For a new team of serving leaders of 13! · InDepth Discipleship program that saw its first batch of 13 graduate and a new batch of 20 that have registered. · Sunday school teachers – from 1 to now having 6 teachers! · Serving teams of about 35 people who serve joyfully. · For the many songs Navaz has written to bless the church and that are sung regularly in our midst. You can listen to the songs by clicking on the link. · For great friends in the neighborhood who have been like an oasis in the dessert. · For many, many answers to prayer right from praying for barren wombs to become fruitful , to jobs being released, to the sale and purchase of homes, to the cough and cold being healed. Celebrating 10 years is a milestone on a journey that has only just begun. Greater things are yet to come. We all have a part to play. We are ever thankful to a faithful God. Amen. This message was preached by Colin D Cruz at Word of Grace Church on the 7th of July 2013. You can listen to the audio by clicking here. Family is all about relationships and communication. Good relationships and healthy communication keep a family close and strong. This is true for the Church family as well. More churches are torn apart from within than an outside attack. the deadliest enemy of a healthy church is an uncontrolled tongue. There is something that we do that takes up 1/5th of our life i.e talking. Every day we speak between 18-30,000 words ( For men the average is 25,000 and for women its 30,000) In a year you could fill 66 books of 800 pages each of all the conversations you have. Speech has incredible power. Talking always existed. In the beginning was the WORD. The Trinity was always in communion and communication with one another. Talking was involved in the fall : Satan and spoke to eve. Talking is involved in salvation: you have the hare the message and you have to confess with your mouth that Jesus is Lord. Talking is the essence of fellowship. Its unnatural not to talk specially in a Christian community situation. Talking is one of the secrets to good leadership. A good leader communicates. Proverbs 10:19 also warns us that where words are many sin is not absent. We can be rude, harsh, unkind, and critical with our tongue. James refers to the tongue in every chapter of his book. If you want to know the spiritual state of a person check their speech. James 1:26 your tongue is your spiritual thermometer. Therefore we need to control our tongue and what we speak. 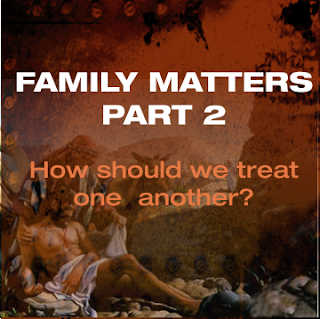 How do we relate in a church family in a wholesome way? 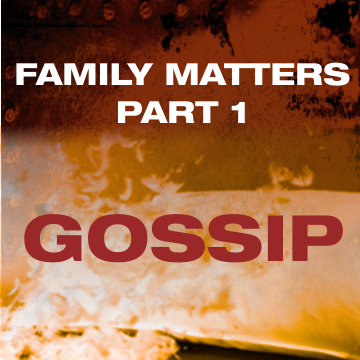 What is gossip and how do we handle it and avoid it? James 3 Compares the tongue to a bit in a horse’s mouth. With the small bit a horse is controlled. Its also like the rudder of a ship. In the same way the tongue will determine your spiritual state : present and future. What does God think about gossip? 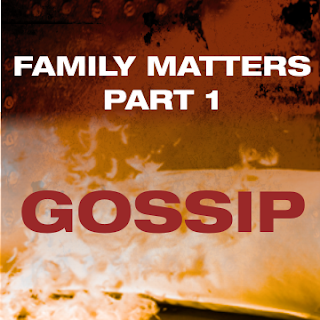 Rom1:29 Gossips are bracketed with murderers. The sin of gossip is not minor but a serious sin. 2Cor12:20 What is gossip? : “ It is the spreading of unfavorable information about someone else even if that information is true “ Jerry Bridges. Rick Warren: When we are talking to someone who is neither a part of the problem nor solution it is gossip. Gossip does not build up. SLANDER: When you know it’s not based on facts and you do it to tear someone down. Slander has the same root word as the devil. Rev 12:10 the devil is the accuser of the brethren. 1Tim 5:13 This could be anyone- men, woman, young and old. Gossips can also happen with legitimate negative information but we spread it. Gossip can happen when we have a disagreement with someone. A hurting party goes to 10 other people and shares their side of the story. What we need to do is what is in Matt 18. However sometimes weak/timid people cannot handle it on their won. Then you can talk to someone who can help you to resolve the issue. The accuracy and the motive are important. Gossip is like a choice morsel Proverbs 26:22. There is something about gossip that is attractive. It goes down to the inmost parts. WE are all susceptible to this. James 3:2 one who has control over their tongue has maturity. 2. Everything we say is being recorded Matt12:36-37 we need to give an account for every careless word spoken. What can we do if we have gossiped? Gossip will destroy the body of Christ. It is like cancer or gangrene that has to be dealt with. What can you do when someone starts to gossip? Ask them these questions: Why are you telling me this? I am uncomfortable with what you are saying. Now that you have told me this what are you going to do about it before I do? If a person has been hurt and unburdens on you, you have a responsibility to now help that person reconcile the situation. If you can’t do it, get someone who can involved. Prov 20:19 A gossip betrays confidence. T- Is it True ? We need to excel at building each other up Eph 4:29We are the body of Christ. When Paul was persecuting the church Jesus said to him “why are you persecuting me?” When we harm the church, it the body of Christ we are harming. What is not gossip? When you tell a person, who can do something about the situation. Let’s practice speaking positively and encouraging one another. We have a deadly weapon with us – the tongue. Your tongue can lift up the whole congregation or it can tear it down. Let’s do the former.